Students from UM and MSU discuss small scale agriculture with Frank Wilbourn at his farm outside of Lambert, MS.
Students from the University of Mississippi and Mississippi State University spent their spring break traveling the Delta to learn more about the region and participate in service projects. Eleven members of the UM community joined 20 MSU students for an “alternative spring break” program, staying in Greenwood and Cleveland. The group took part in a civil rights and cultural heritage tour sponsored by Delta State, performed community service at several schools and family farms, learned large scale agriculture, and canoed on the Mississippi River. 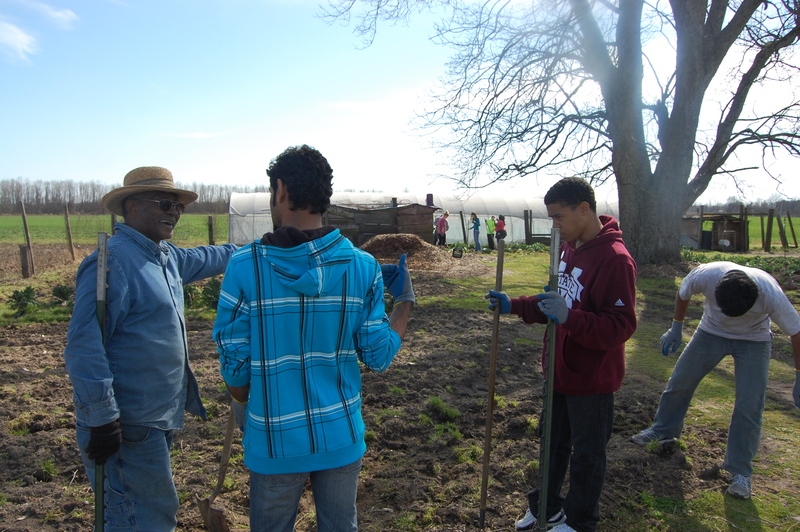 Academic discussions at Mississippi State and during facilitated discussions in the Delta focused on the region’s blues and arts traditions, the changing landscape of the agricultural economy, and civil rights legacy. The trip was sponsored by the McLean Institute for Public Service and Community Engagement at the University of Mississippi and the Office of Student Leadership and Community Engagement at Mississippi State University. Planning for the trip was coordinated by AmeriCorps VISTAs from both schools (Ryan Parsons and Erin Mauffray from UM, Heather Black and Lacy Jaudon from MSU) .